When personalizing an eCard you may come across an error that says "I'm sorry, the content you've entered isn't valid. Please remove all special characters from your message." Our team is currently working to correct this issue. 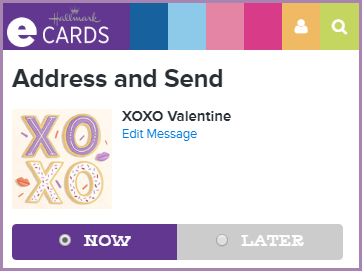 At this time, we do have a workaround that allows you to send an eCard without issue. In order to complete this task, please click the 'Edit Message' link, below the eCard title (see below). Once you're back on the Personalization page, just click the 'Address and Send button once again, enter the recipient and click 'Send eCard'. To prevent this from happening in the future, please add your personalized message to your eCard before changing any color or text options.